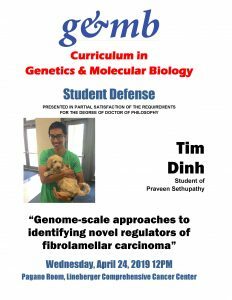 Weekly seminar series featuring talks from the students of the UNC Curriculum in Genetics & Molecular Biology. 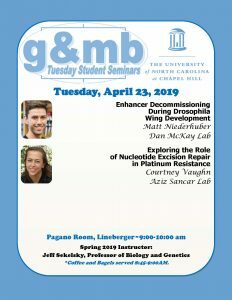 This week’s speaker is Matt Niederhuber from the Dan McKay Laboratory and Courtney Vaughn from the Aziz Sancar Laboratory. Weekly seminar series featuring talks from the students of the UNC Curriculum in Genetics & Molecular Biology. 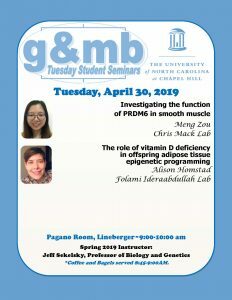 This week's speakers are Meng Zou from the Chris Mack Laboratory and Alison Homstad from the Folami Ideraabdullah Laboratory.